Ryder Henry's "Plasma Wing Schmatic"
Ok, full disclosure here. The artist in this show, Ryder Henry, is my husband. But hey, I’m not the only one who thinks his work is cool, the folks at WildCard in Lawrenceville decided to give him a show! And you should come out Friday, February 11th for the opening from 6-9pm at WildCard (4209 Butler Street). There will be free food, drinks and music! 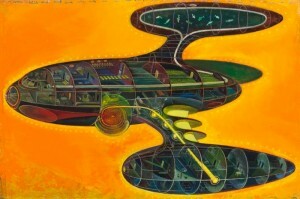 “4 Lydia is, was, and will be a great space nation” will feature building and spaceship models made out of reclaimed materials, paintings of the models, and will be the first show incorporating sculpture at WildCard. For more info click here. While you’re there, pick up something for your sweetie or BFF for Valentine’s Day. WildCard has a great selection of local, handmade gifts and cards! « What the What is Wawadoo?